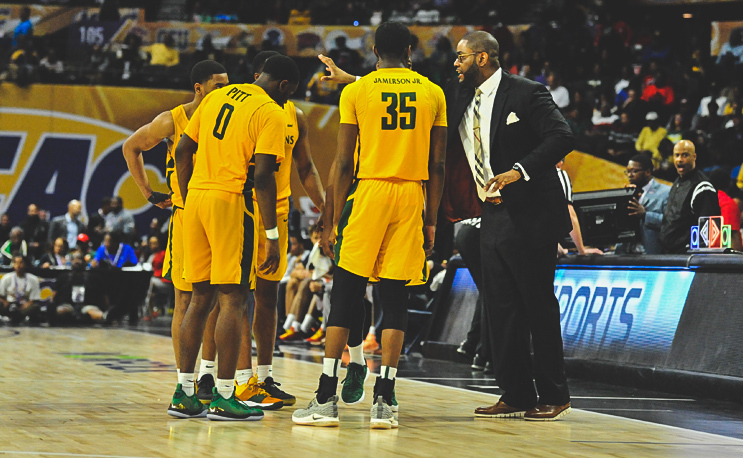 Norfolk State’s Robert Jones get another honor in the wake of his team’s NIT win over Alabama. NORFOLK, Va. – Norfolk State men’s basketball head coach Robert Jones was named the National Association of Basketball Coaches (NABC) District 15 Coach of the Year on Friday when the organization announced its coaching honors for Division I.
Jones earned his first NABC Coach of the Year honor after also taking home the MEAC Coach of the Year award this year for the first time in his career. He led the Spartans to the MEAC regular season title at 14-2, the program’s second ever, and the fourth 20-win season since NSU moved to Division I in 1997. The Spartans own a 22-13 overall record this year, which includes an NIT first-round upset of No. 1 seed Alabama on Wednesday, 80-79 in overtime. Jones led NSU to the first NIT win for the program in its second all-time appearance in the tournament as well as the first win by a MEAC team since the tournament’s current format started in 2007. Jones is also a finalist this year for the Hugh Durham, Skip Prosser and Ben Jobe awards presented by College Insider. Winners will be announced on April 5. Voting for the all-district coaches was done by member coaches of the NABC. District 15 includes all MEAC schools. The Spartans will play at Colorado on Monday night for the second round of the NIT.